Overseas Employment Certificate (OEC)	otherwise called as the e-receipt, exit pass and sometimes referred to as the overseas exit clearance based from our research online is actually one and the same. For those who are having a hard time trying to distinguish one from the other, let this article help you know more about this Philippine document. What is an OEC? It is part of the governing rules and regulations of the Philippine Overseas Employment Administration to have it as a requirement to be presented as a requirement document in any exit ports in the Philippines for OFWs. Whether you are working abroad, land-based or sea-based to be properly documented and protected. Therefore, no OFW should leave for whatever work purpose outside of the country without securing this small paper from the POEA unless you are under the balik-manggagawa program. If you have the OEC, it means you are exempted from paying travel tax and airport terminal fees as well. Singapore-bound OFWs on the other hand may apply either in the Philippines or in Singapore. For returning OFWs, you may opt in to apply through the Balik-Manggagawa OEC system. Inside the official website, you will have the choice to pick which location you want to get the document. Below is a shortlist of the different offices where there is a catering counter that allows transaction for the exit pass. Trinoma Mall in Quezon City. If you are only on vacation and staying in the Philippines for five (5) days or less, you can get the OEC at the Labor Assistance Counter of the airport terminal. There is an option for OFWs working in Singapore to apply for this document at the Philippine Embassy in Singapore. Less, you have to first make an online appointment as the POLO no longer entertains application without online reservation. It is best to apply before travel or best option is to apply for multiple OEC if you are on to travel multiple times. For hassle-free and no-appointment setting walk-in applicants who are applying for POEA jobs abroad, you may do so by visiting the nearest branch or regional office near your area as listed below. 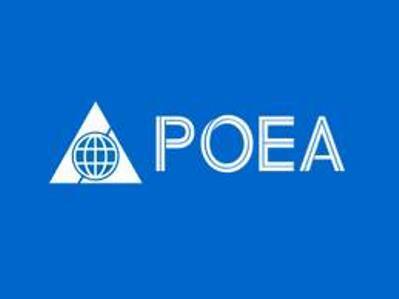 The POEA has already launched last November 2012, the availability of online appointment system for application of the overseas exit clearance. But if you are just applying for local Philippines jobs, there is no need to secure one. Below is the step by step procedure on how to reserve a slot before reporting for very long line at the POEA office near you. Undocumented Workers/No record(tourist/student/dependent to contract worker). Workers bound to restricted/banned countries. Only OFWs are required to get an OEC. In this case, OFWs would include: work permit holders such as domestic helpers as well as S-pass, E-pass, PEP and TEP holders. What are the requirements for Issuance of Overseas Employment Certificate? Where and when to file an OEC? OEC applications may be filed at Window 3 of the Philippine Embassy and the schedule of filing is from Mondays to Fridays from 9:00 a.m. to 12:00 p.m. and 1:00 p.m. to 3:00 p.m. The issuance of exit pass are being done only during Sundays at Lucky Plaza. How long will is processing time of Overseas Employment Certificate? During ordinary days (not peak season) it only takes 5 to 10 minutes if the applicant will provide the complete and right documentary requirements. Can a household service worker (DH) (domestic helper) apply directly with the embassy to secure the document, without passing thru Singapore agent (SinAgent)? Yes, provided she has a valid employment contract processed by the Philippine Embassy, in addition to other documentary requirements stated above. How much is the processing fee for Overseas Exit Clearance? S$3.00 payable in cash only (singaporean dollars). Any OFW who intends to travel to the Philippines two or more times in the same calendar year may apply for and will be issued multiple OECs as per directive of the Philippine Embassy. Issuance of MTEC will be subject to validity of the work pass and OWWA membership presented in exit clearance application. What are the requirements for the application of a multiple travel exit clearance? How Much is OEC Fee and Charges? (Mondays to Thursdays from 9:00 a.m. to 12:30 p.m and 1:30 p.m. to 3:00 p.m.). Another venue for your application is at Lucky Plaza – 304 Orchard Road, #03-11 (Sundays only from 9:00 a.m. to 12:30 p.m. and 1:30 p.m. to 3:00 p.m.). How much is the OEC fee? 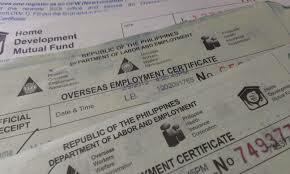 What are the requirements for Balik-Manggagawa Overseas Employment Certificate? Processing Fee of Sg$3.00 per document. What is a single Balik-Manggagawa Overseas Exit Clearance? Single document (white color) is valid for a maximum of sixty (60) days from date of issuance. What is the BM- Multiple Travel Exit Clearance (MTEC)? Starting on 1 July 2013, the MTEC (green color multiple travel exit clearance) shall have a validity that is co-terminus with the employment contract but not to exceed a maximum of two years, while still employed with the same employer and returning to the same worksite. N. B. Validity of exit pass will depend on the requirements presented at the time the worker applies, that is: (a) OWWA membership validity; and (b) Work Pass validity. For an applicant who cannot personally go to the Phil. Embassy, he or she may request another person to apply on his/ her behalf by submitting an authorization letter along with the above requirements. For married couples, the legal spouse can apply for overseas employment certificate even without authorization letter as long as the original documents/ requirements are presented. Can multiple OECs still be used if a worker transferred to another employer? No. If a worker applied for multiple OECs and has changed employer, unused OECs can no longer be used. The worker should renew his/ her membership with OWWA, and subsequently apply for new OECs, if needed, under his / her new employer. Can unused Overseas Exit Clearance still be used if the worker has renewed his/her passport? Yes, as long as the unused document is valid, the worker can still use it provided that the old passport is attached/ presented along with the new passport to the concerned immigration authorities. Can workers who transferred to a new employer and are holders of In-Principle Approval (IPA) apply for Overseas Employment Certificate? No. Workers who transferred to another employer and are holding IPA letter issued by the Ministry of Manpower (MOM) cannot apply for the document until he or she gets the new work pass card, pay OWWA membership fee and Pag-Ibig contribution for the current month. What are the requirements for Overseas Workers Welfare Administration (OWWA) membership/ renewal? For Household Service Workers (HSW) holding work permits, please present the POEA Standard Employment Contract verified and authenticated by the Philippine Embassy. What is the validity of OWWA Membership? OWWA membership is on a per contract basis, and valid for a maximum period of two (2) years. OWWA membership insurance/ validity will depend on the work pass presented at the time of application.